All about Halkidiki’s Olive Oil! 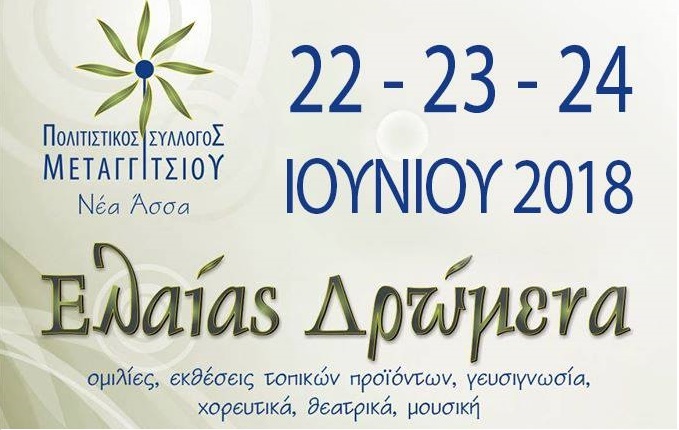 For the 5th year, the Cultural Association of Meraggitsi is organising a 3day event (22-24 June 2018) about olive oil and table olives produced especially in Halkidiki! Halkidiki produces a great amount of olives and olive oil with distinguished quality and taste. The village of Metagitsi produces olive oil from the ‘blue’ olive, which is a unique variety not found anywhere else in the world. The event will include exhibition of local products, oil tasting sessions and of course, live music and dance. Come along and be part of this gastronomy feast!